Customer expectations are evolving fast. When interacting with brands, people demand smarter, more connected, more personalised, and more seamless experiences, across every single touch point. And as we become increasingly connected to smart technology, the pressure to deliver that seamless experience for our customers is only going to increase. Many businesses understand this challenge, but are struggling to cope with the sheer volume of data available to them; it can be overwhelming to know what to do with it all. 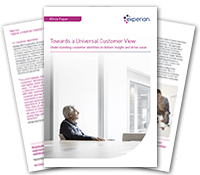 In this white paper, we explore how organisations can turn that data into useful information, unlocking its value and delivering better outcomes for their customers.